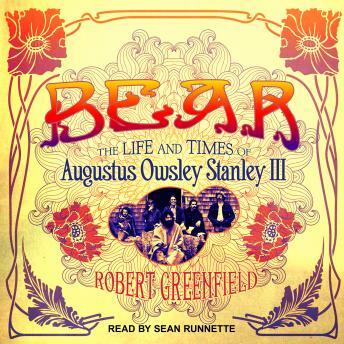 The creator of the dancing bear logo and designer of the Wall of Sound for the Grateful Dead, Augustus Owsley Stanley III, better known by his nickname, Bear, was one of the most iconic figures in the cultural revolution that changed both America and the world during the 1960s. Owsley's high octane rocket fuel enabled Ken Kesey and his Merry Pranksters to put on the Acid Tests. It also powered much of what happened on stage at Monterey Pop. Owsley turned on Pete Townshend of The Who and Jimi Hendrix. The shipment of LSD that Owsley sent John Lennon resulted in The Beatles' Magical Mystery Tour album and film. Convinced that the Grateful Dead were destined to become the world's greatest rock 'n' roll band, Owsley provided the money that kept them going during their early days. As their longtime soundman, he then faithfully recorded many of the Dead's greatest live performances and designed the massive space age system that came to be known as the Wall of Sound. Award-winning author and biographer Robert Greenfield's definitive biography of this Grateful Dead legend masterfully takes us through Owsley's incredible life and times.